Just to make sure you don’t get the wrong idea about our family from last night’s post – like we walk around with halos on comforting one another and holding hands all the time – I had to share with you yesterday’s classic moment. Our third daughter, Caroline, is what you might call a firecracker. She was born with a voice and made sure she came out into the world using it. She can be oh so sweet but she can also be oh so spicy. Yesterday after lunch, we were driving home, and our oldest daughter, Lillian, began to tell me how atrocious Caroline’s behavior was during lunch. Apparently, she had slammed her sister’s food on the floor, burst into tears multiple times, and was continuously demanding her own way (shocker). Sigh. Lillian and I just looked at each other and laughed. There is only one Caroline. And good thing. Don’t think I have enough energy for two. Last night I took Caroline and Mia Grace to Orange Leaf for some frozen yogurt. I haven’t had any since returning from China, and on long, hot summer evenings, yogurt always sounds like a treat. (Obviously, from the past few posts, our family is not on a gluten-free, sugar-free diet. We are on more of what you would call a “Welcome-to-America-and eat-cake-and-ice-cream-and-french-fries-kind-of-diet.” Maybe we will decide to go back to healthy eating when MG starts sleeping through the night.) But I’m going to be really honest; while the yogurt was good, I was a bit taken aback by all the stares. I’m just still not used to them. They startle me. Jar me on the inside. Take me aback. I’ve never been one to like to have attention drawn to myself (just ask my mom), but it’s pretty clear that staring is something I am going to have to get used to now that Mia Grace is a part of our family. I was used to the stares in China; they actually didn’t bother me. And I really didn’t blame anyone for staring. The stares were an expected response to blonde heads, blue eyes, and white faces with one Chinese baby smack dab in the middle. Wow. I don’t think that’s a question I would even ask a close friend, much less a total stranger. I think I mumbled something about feeling “called” and “led” and used trite, overstated Christian jargon that probably made no sense to the man and walked away trying to collect my thoughts. Jason had a really eloquent response when I posed the question to him later, but eloquent responses usually elude me in the urgency of a moment. But that should have been the heads up. 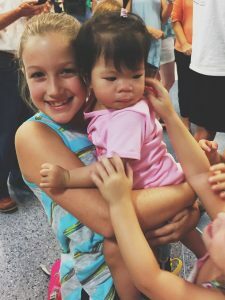 Many people in America are thrilled that we have added a Chinese daughter to our family; but some Americans also don’t understand why we would spend so much money, take so much time, and travel half way across the world to adopt a child that is not only miles but cultures away from us. The reasons why should be saved for another blog. But his comments should have prepped me for the stares. From the moment we walked off our sheltering runway from our plane from Hong Kong to America, we were assaulted by stares in wide open spaces. Me especially, since I’m usually the one carrying Mia Grace. And just a word of caution to all of us who want to stare – and I am including myself in those who stare because I’ve done plenty of staring over the course of my 38 years – PEOPLE KNOW WHEN YOU ARE STARING AT THEM. I’ve always thought I could sneak a side glance and the person I am watching would have no clue. It was a relief to take our frozen yogurt to the tables outside and sit in a stare-free zone and enjoy the faces of my two girls in front of me. I didn’t get one smile in Orange Leaf last night; just stares. And one smile would have made all the difference. Trust me; I’m not feeling sorry for myself or crying tears over tonight. It’s just the reality of adopting a baby from a different race. I just have to get used to being an anomaly. And I will get used to it – over time. But until then, just remember to smile when you choose to stare. It makes the bitter edge of being different…sweet. Mia Grace had stopped her crying and fallen asleep while holding Caroline’s hand. Our differences are giving us the capacity for comfort. It’s a lesson our whole family is learning, one little hand at a time. We are so thankful for each of you and the joy and comfort each one of you brings; in the days ahead, I am looking forward to seeing each of your encouraging smiles. Yesterday, I left the girls and Jason for an hour and a half to make a mad dash to the grocery store; our cupboards were looking pretty bare. 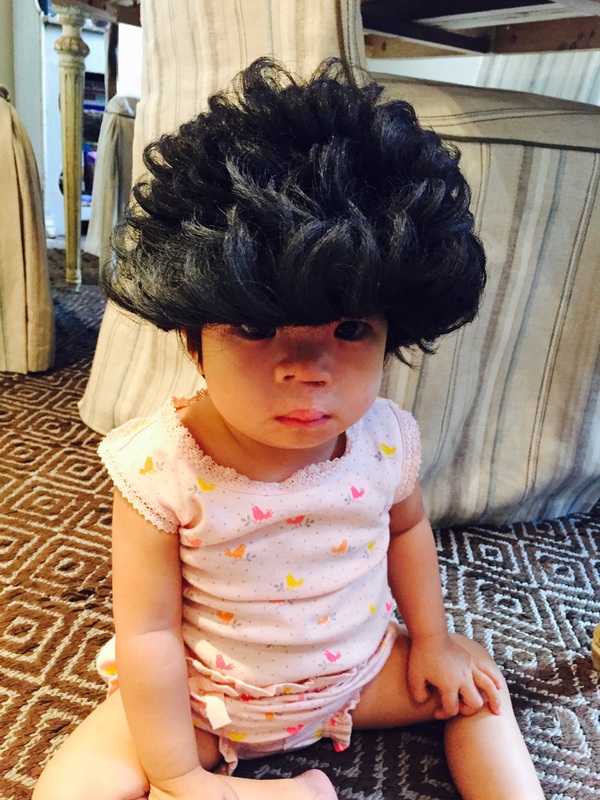 I’m not sure what I laughed harder over – the ridiculous looking wig or the serious look on Mia Grace’s face. In all seriousness, though, it has been a long few days for Mia Grace. The past two nights she has woken up with hard, panicked cries, either like she had a bad dream or is completely disoriented and cannot figure out where she is, or perhaps even as if she is grieving. Thankfully, she is willing to be soothed and patted and rocked, but the cries continue off and on throughout the night, and she was awake a solid two hours from 1-3am last night. During the day she has been teary and particularly clingy to me, behavior we never really saw while in China. But she cries because it was all she knew. It was her familiar. On one hand, my heart aches that the orphanage was her familiar and that she misses it. On the other hand, I long to communicate to her all that her adoption means and the benefits of “family, sisters, mom, dad, grandparents, aunts, uncles, cousins, and friends.” But I cannot communicate logic to an 18 month old’s cries, so the only option I have is to wait, and watch, and love, and hold, and pat, and kiss, and pray. Grief is a thing that cannot be rushed. And neither can the new becoming the familiar. We will have to wait to become her new familiar, her new place of trust, comfort, and love. And while I wait, I am reminded of the One who waits for me. Of the One who patiently waits for His heart, His family, His ways, to become my new familiar. I have always thought of Him with a disapproving glance in His eyes as He waits for me to adjust my lenses to His holiness, but now I know differently. He waits with tears in His own eyes as He watches us grieve, struggle, and suffer over things that usually weren’t that great to begin with. He is so patient with us and “waits from on high to show us compassion” (Isaiah 30) again…and again…and again. I need that same patience and grace (there’s that word again) as I wait for Mia Grace. Please pray that for me and for her. And please pray for sleep! We all feel about the equivalent of a slug trekking through jello as we slowly adjust to a 13 hour time difference, and I am sure Mia Grace feels it most of all. On a happy note, we were able to celebrate my sister-in-law, Haley’s, birthday tonight over dinner and cake. Mia Grace thoroughly entertained us eating by eating french fries and having her first taste of…CAKE. And not just any cake, but Teresa Medeiros’ homemade butternut cake. About four bites in, she pushed the fork away and started pushing pieces of cake with both hands into her mouth as fast as she possibly could…smart girl! Anyone who likes Teresa’s cake that much is one smart cookie and is going to do just fine with her new familiar. Off to bed…praying everyone sleeps well in your house tonight and in mine.